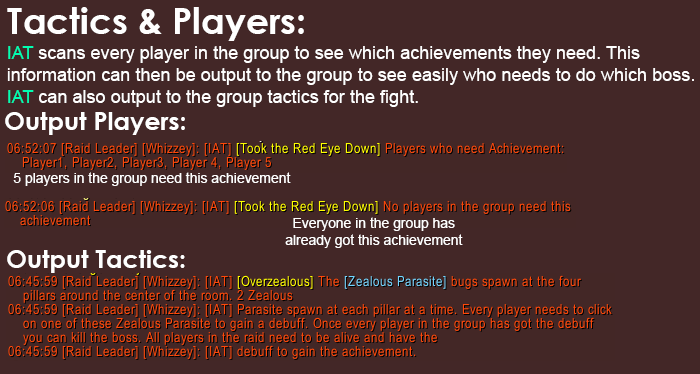 Tactics kindly contributed by the Achievements Discord Server, the community where members can meet like-minded completionists and form groups for a variety of achievements. For the achievement "The only escape" on Halfus Wyrmbreaker" the addon says "achievement complete" before either of the drakes are killed. I killed the boss because it told me the achievement was complete but I didn't get it. Came back a week later to try again and it's doing the same thing. 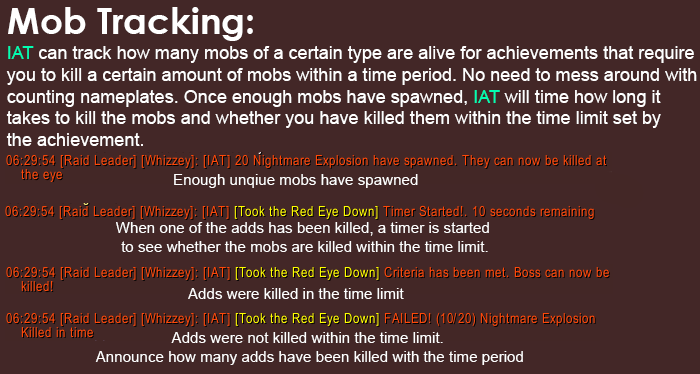 As soon as I free the drake it says complete but the achieve requires you to kill the drakes within 10 seconds of each other not just free them. Why would it say complete before they're dead? Thanks for the report and im sorry the addon announced the criteria was met when it clearly wasent. I'm currently investigating this now and can hopefully find the issue. For the "abuse the ooze" achieve on Sjonnir the ironshaper the tactics note says "wait for the ooze to form into ONE iron sludge. Kill it then kill the boss" but the achievement requires you to kill FIVE iron sludges. If you follow these directions you will fail. I don't know if is because I already completed the achievements or not but I'm trying to help a friend to complete their achieves for both, Glory of the Legion Hero and Glory of the Argus Raider and every time we meet the achieve the addon gets crazy on both Raid Warning and Chat repeating the same message over an over that we can kill Boss and that I already complete the achieve on 10/11/18. Even after we kill Boss both Chat messages and Raid Warnings don't stop and the only solutions is to reload UI. I've had a few reports of the issue but I've not sure what is going wrong exactly. Which language were you running the game as?. Also if possible would you be able to send me the IAT log. It may have some clues as to what went wrong. It normally located here C:\Program Files (x86)\World of Warcraft\_retail_\WTF\Account\<Account Name>\SavedVariables\InstanceAchievementTracker.lua. I had BugSack and Grabber installed so I went there and here is what I got. (*temporary) = "At the start of the fight pick up the IAT_129207. You then need to wait for the boss to reach 100 energy which will begin phase 2. During phase 2 face the shield you picked up at the start of the fight towards the |cff71d5ff|Hspell:232502:0|h[Shadow Blast]|h|r. Once 20 |cff71d5ff|Hspell:232502:0|h[Shadow Blast]|h|r have been reflected with the shield, the achievement tracker will turn white and you can kill the boss." 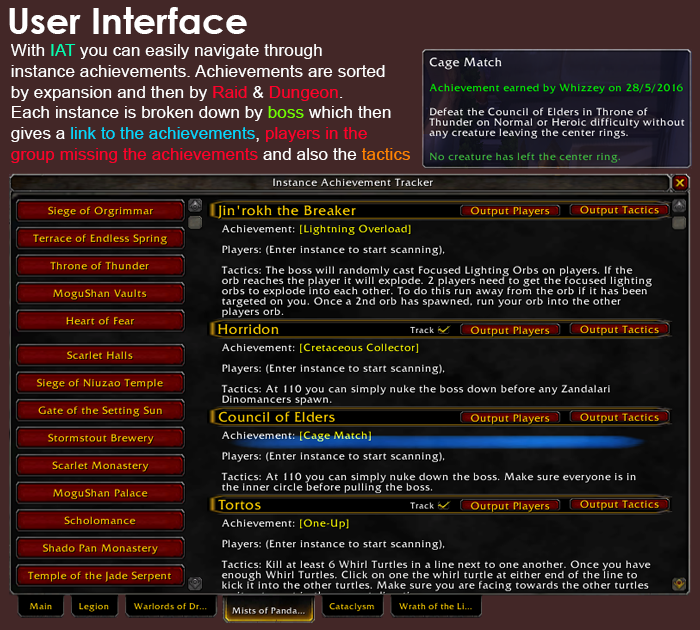 Here is the link for you to download the InstanceAchievementTracker.lua. Let me know when you get it so I can delete the file in WeTransfer. Thank you for this. I have downloaded the IAT log now and I've also *Hopefully* fixed the 3 errors above for the next version. The spam issues looks like it was caused by ticking "play a sound when an achievement is completed" but not selecting an actual sound to play. I've now changed that to select a sound by default and it will also go back over people's config and fix this for them. So what you're saying is that if I had selected a sound for "play a sound when an achievement is completed" I wouldn't had the issue? 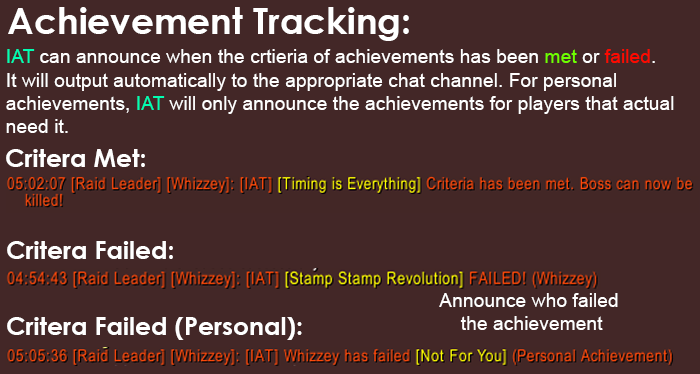 Damn, I not even noticed because I had all the options in default and never changed anything really until yesterday when I disabled "Announce Messages to Raid Warning" but the chat message spam issue still happened after we met the achieve. I got this error today apon exiting Black Rook Hold. (*temporary) = "attempt to index upvalue 'InfoFrame' (a nil value)"
I'm not quite sure what the issue is. I've tested the addon on both english and german and it seems to be working ok (for me anyway). Do you have any error messages or anything. If not you could try downloading Bugsack and Buggraber addons to see if they report any issues. Have you tried a different raid/dungeon since not all achievements can be tracked. There should be a popup window when you enter a raid/dungeon to ask whether you like to track achievements or not. In the meantime I will continue to look to see if there is anything that would prevent the addon from working for other languages. Thanks for pointing this out, you are correct it's a language issue. I've completely overlooked how instance detection would work in other languages. I will work on getting this fixed up for the next version but it's going to take a while to localize this for every language. do these pop up in timewalking? i may have missed the enable popup or i was drunk!